This piece of card was extra glossy and I wasn't using only Fresco paints, so I started with a layer of gesso. I smooched it around with a brush, and didn't give the brush strokes a slightest thought before they showed up as I started brayering with colours. Actually I like the painterly look it gives, could do that just for the effect even if it wasn't necessary as a base! I divided the base i two and used different stamps and Versamagic inks for both. 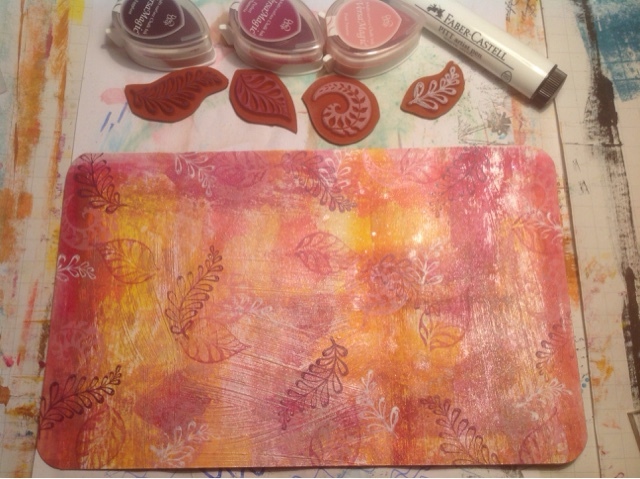 I stamped the first half with Lavinia stamps. I used an embossing dabber through a stencil to add snowflakes, and realized (too late) that the stamping was still wet. I didn't wants everything to turn out white, so I used a brush to wipe of the white embossing powder where I could. I added shiny kaleidoskope powder to emboss the parts where the white had been over the stamping. The result is kind of grungy, the stamping barely shows. 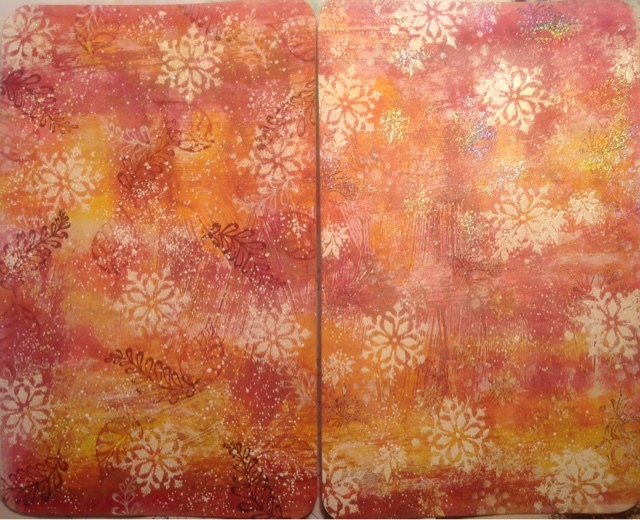 After this pic I also added chunky white embossing sprinkles. The second half was stamped with stamps from Ryn. 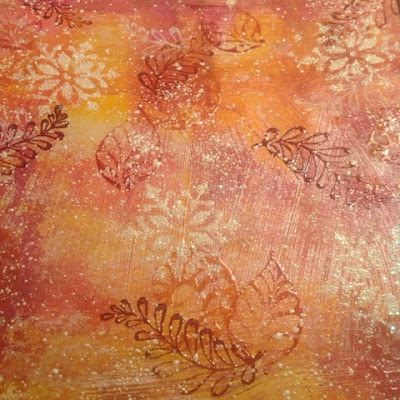 I used the same inks, but decided to be smart and heat emboss the stamping with clear embossing powder before the stenciled snowflakes. 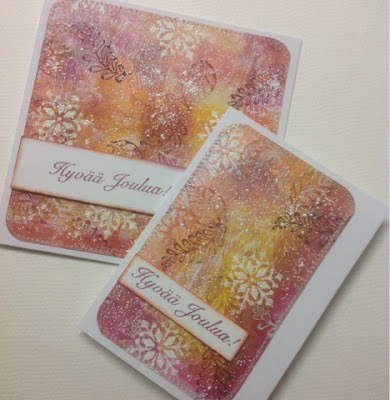 I really like that the stamping pops out with the embossed dimension. 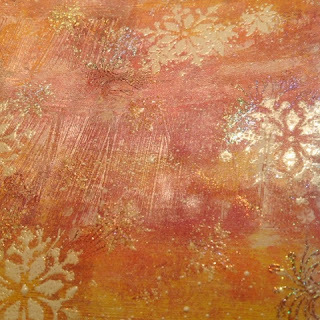 The snowflakes were embossed with a sparkly white and I added splatters of chunky white embossing. Here's the pair again. I chomped the corners, because he original corners of the card were rounded. 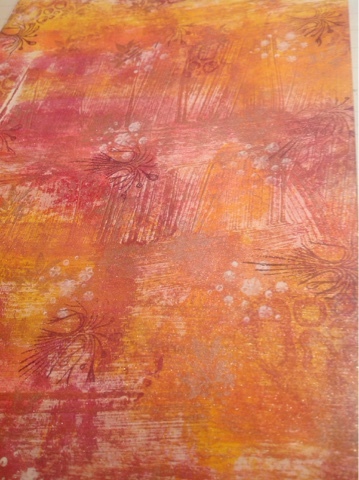 Both pieces cut nicely into a 5,5 x 5,5 inch square and a narrower panel. I already used the left piece for two cards. The above pictures have been taken under my gloomy work light, the below gives a better picture of the actual colours... or perhaps the real colour is somewhere in between. The text says "Merry Christmas" in Finnish.